Years ago, long before Willow was born, I hiked up to the top of Mt. Whitney. A family friend flew me down to the Lone Pine Airport and I met up with another friend who was in the area doing some work for the Fish and Game Department and L.A. Water & Power. Having checked off that bucket list item of the highest point in the contiguous U.S. it only seemed appropriate to take the opportunity of being at the lowest point in the contiguous U.S. as well. 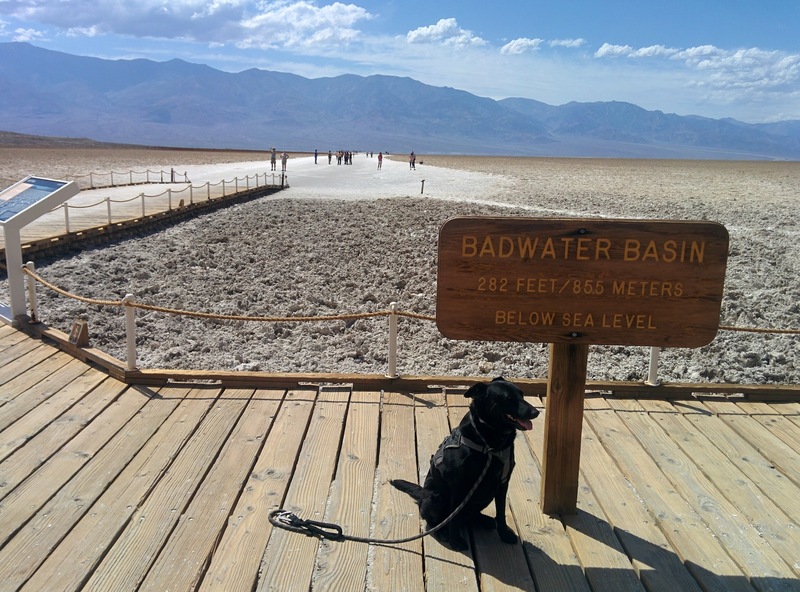 So, when this Death Valley trip came to fruition I knew that Badwater Basin was definitely on our list of places to visit. We left the Geologists’ Cabin and headed out Warm Spring Canyon Road until we came to West Side Road which eventually intersected with Badwater Road. Heading North towards Furnace Creek we passed Mormon Point which seemed to be little more than a sign saying “Mormon Point” and then…not much else. I am sure there is a story involved but it just looked like so much of nothing we just didn’t care. We were on a mission! It went off without a hitch. Down to the sign, take a picture, back into the air-conditioned Tacoma in, literally, all of 5 minutes. If Willow had a bucket list this probably would not be on it but still, that box has now been checked because I’m the dad and I say so.